Early readers of my blog will know that Cherry was a terrible sleeper. After a few weeks of not being able to put her down without her waking up I turned to Google for answers on how I could get her to stay sleep. I came across some articles about ‘swaddling’ and some forum discussions about how it had really helped some mums get their babies to sleep. I decided to give it a go and it really did help. The only problem we had was that I didn’t start doing it until she was about six weeks old so she was a bit old for it to have the best effect. I know that all babies are different so I was hoping that Tiger wouldn’t need any help to sleep at night and initially he didn’t but after the first couple of weeks we started to have some unsettled times in the early hours of the morning so I decided to try swaddling to see if it helped. And once again, it did! I have tried out several swaddling devices but I am always on the lookout for more so I was excited when Puckababy asked me to review one of their products. 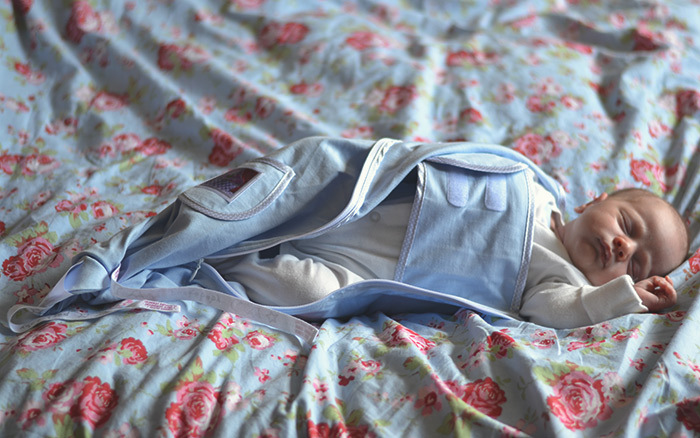 It’s called The Original and is a baby sleeping bag suitable for ages 0-3 months. The Original has been designed to offer the baby security but without swaddling it in a way that is too tight and restricts movement. It comes in seven colours and also three specials – organic cotton, a special material for when it’s cold and one for when it’s hot. We tested the baby blue sleeping bag and the quality of the material is apparent when you touch it. I have washed and tumble dried it several times already but it still looks new. I also love the little logo and labels that have added. There is a zip that goes down the side and you place the baby in the middle. Then there are two flaps with velcro on that hold the babies arms in place. Then you zip it up and tie the excess material up at the bottom. I can’t help but laugh when I see babies in these kind of sleeping suits and I always feel a bit cruel doing them up but they really do seem to love the feeling. Within two minutes of doing it up he had fallen asleep and I have also put him in it for the last three nights and (touch wood) he has slept really well in it. Having a zip is a big positive as the swaddling blankets that I have used in the past all seem to come loose and I find myself redoing them every time I picked them up for a night feed. This keeps his arms in place all night without me needing to do anything. 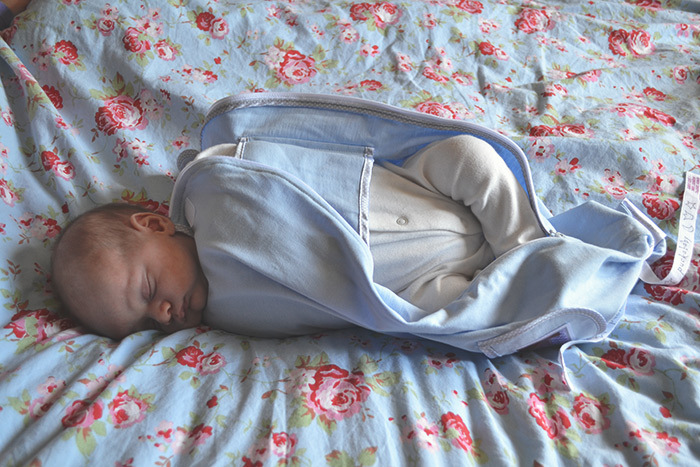 The only thing that I might change would be to add a double zip to make midnight nappy changes easier but overall I am really impressed with this product, in fact out of all the swaddling aids I have tried, this is definitely the best. I tried a Woombie when Cherry was little, which is quite similar to this but without the arm straps / foot ties, and it just wasn’t tight enough to offer enough support. The arm straps really work well. Tiger loves being in it and it helped him fall into such a deep sleep that he didn’t even wake when I undid it! Puckababy sell a range of products to aid baby sleep including a sleeping bag which changes with the four seasons – a brilliant idea! Disclaimer – I was sent this product free of charge for the purpose of this review but all the thoughts and opinion are, as always, my own.